TOPAZ HORIZON: A big thanks to all who help moms! A big thanks to all who help moms! This post is brought to you by SMART Communications. I've been away from this blog for soooo long! The elections took nearly all my attention, stole away my time, and drained me emotionally. In fact, I almost forgot it was Mother's Day last Sunday. That was how consumed I was with the whole thing! 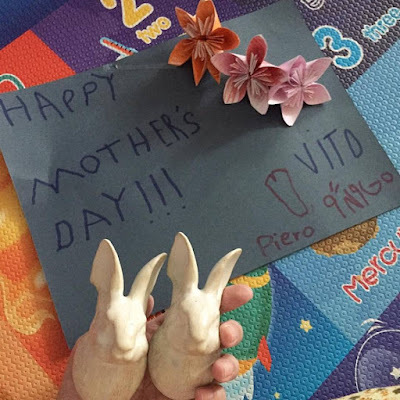 But my husband and my kids surprised me with a sweet card decorated with handmade flowers, and added rabbits to the mix! I don't want to pack it away. The kids made those flowers themselves. I'm a lucky girl. I know I keep saying that. Someone told me baka ma-jinx. Ako naman, my belief is if you're not acknowledging your blessings, they'll be taken away. So araw-araw talaga, I look at my husband, my kids, my life and say, "Thank You, God! I don't know what I did to deserve them because You know I don't deserve them, and yet You gave me them. Thank you!" As a mother, I especially want to honor my husband for being my total partner in parenting. What do I mean by "total"? Well, society has clear-cut definitions of what fathers and mothers should do. Fathers provide and discipline. They should never help with childcare. Mothers take care of the kids and the home. They should never have a career. In our home, however, Vince and I share all responsibilities. There's no shirking of responsibilities just because gender dictates so. He loves the nurturing part—giving our sons baths, feeding them, and teaching them how to read. I like to do those, too! But many times, I'm spent and Vince always swoops in, always ready with a cuddle and a kiss for me and the boys. Some people think that's a mother's job. If that's how they see it, then thank you, Vince, for not shying away from mothering our boys! I have friends who are single mothers and they are grateful for the family who swooped in and stood as fathers for their kids. Some even stood as mothers for those times when my single mother friends had to be away to be providers. I have friends who are lucky enough to have found yayas who love their kids. Those are the best kind of yayas because they will care for your kids with their very lives. Motherhood may be a tough job but I'm glad we have help. Thanks so much to everyone who helps us moms with the mothering. Whether it's our husbands, partners, best friends, mothers and mothers-in-law, sisters and sisters-in-law, brothers and brothers-in-law, neighbors and yayas, God bless the people who share the burden of raising our little ones. Meet the Biogenic Mom Squad! Topaz Horizon x Belo Baby giveaway!!! Iñigo is 4! What fun!